I have learned that the Bonaire seeks to examine expanding their cruise ship market into the year round agenda. Interestingly, this is a widely debated topic on the streets of Bonaire and in the tourism industry. The April 12 issue of Travel Agent was called The Green Issue. It featured green hotels, tours and information on Caribbean resorts and cruise ships. “In a survey from Travel Agent, CruiseOne and Cruises Inc., agents share their thoughts on the importance of green to their cruise ship clients. In a recent survey when CruiseOne and Cruises Inc. asked it’s agent partners how interested their clients were on eco friendly shore excursions 47.5% said their clients were not strongly interested. 29.5% were not at all. Friends of the Earth (www.foe.org) graded the cruise lines for enviromental advocacy. Holland America earned the highest grade a B. According to http://www.infobonaire.com Holland American arrives in port 8 times from April – Dec. 2010. A Nov. 2008 story on Caribbean Destinations, National Geographic rated Bonaire a whopping 68 . It’s sister island Aruba scored a low 48 thanks to multi hi rises and cruise ship tourism. Cozumel, another dive destination has seen a great decline with a low score of 47 largely due to cruise ship tourism. 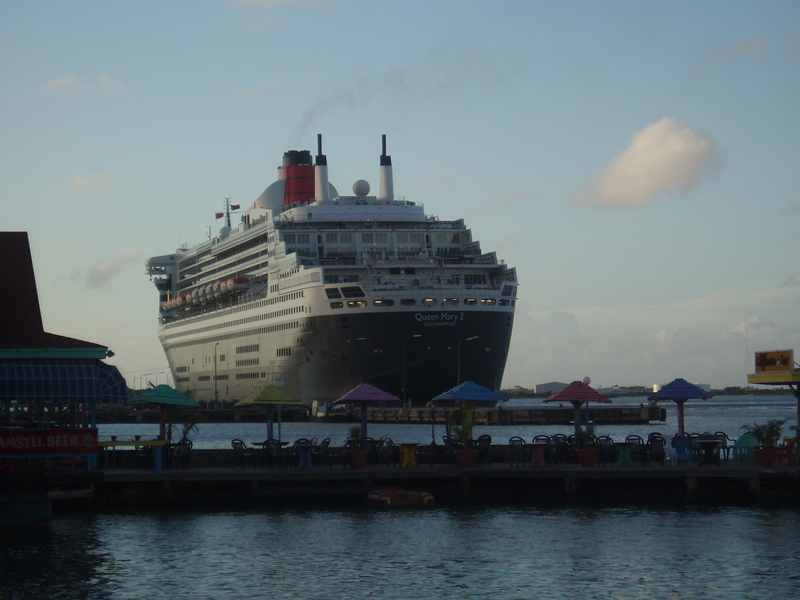 Here are some other informative sights on the impact on cruise ship tourism on the Caribbean. Please decide if this is the direction Bonaire wishes to proceed. To randomly accept and expand on cruise ship tourism without conducting impact studies is sorely negligent, in my humble opinion. If such environmental impact studies are available I implore the government to make these widely available for reader discretion. It bears mention that Bonaire lacks a cruise ship facility and does not presently have the infrastructure to support an industry being courted aggressively. Most business in town see frequent guests seeking to use the restroom facilities. There are only a few toilets available at Lac Bay to support hundreds of guests. Whilst it is recognized there are many locals now employed in the taxi industry, it may not be prudent to provide more cruise ships to pay their WEB, and taxi loans. If cruise ship tourism negatively impacts the island down the road as I believe, we will lose our valuable dive and windsurf clientel. A recent story in the Bonaire Reporter suggests the sea grass beds at Lac Bay are being compromised due to the increase in recreation. It does suggest in my opinion that the recent escalation in cruise ship guests has sorely impacted the bay. I defer to others such as Foundation for Progressive Environmental Solutions to comment. Whilst I am not totally opposed to cruise ship tourism I believe small boutique lines are a better target partner to link with versus the mass cruise ship tourist market. Source: Travel Agent/CruiseOne and Cruises Inc. This entry was posted on May 9, 2010 at 12:22 pm and is filed under Getting to Bonaire. You can follow any responses to this entry through the RSS 2.0 feed. You can leave a response, or trackback from your own site. Yea or Nea, it is a big question and will have 2 answers depending on who you ask. How do you conduct a survey on the island and what type of questions should be asked and which one should you not ask. Surveys can be manipulated and used anyway you like and depending on the questions. 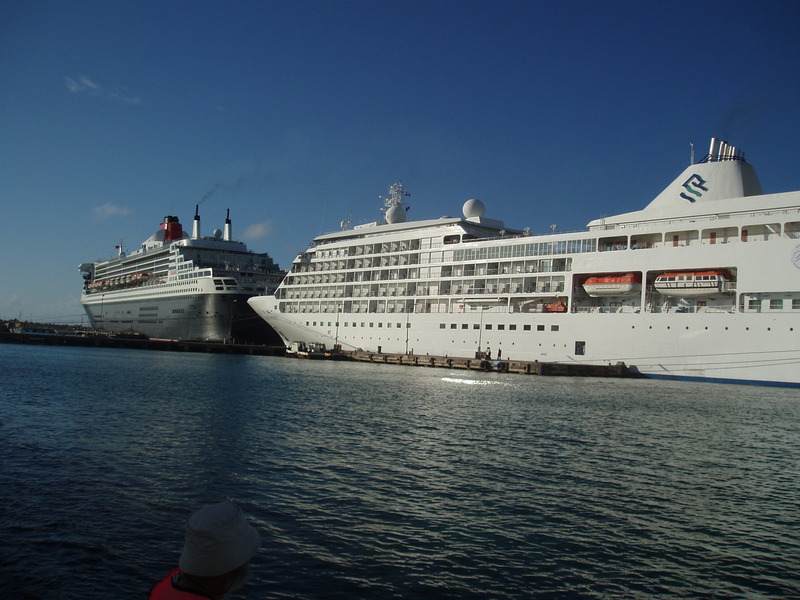 So where do you look in order to get a possible insight as to how an increase in cruise tourism can help the island. We all know why people come to this island and we have photographic history of what the island looked like. So we need to look to other islands and destinations and look at how the industry impacted the community and the environment. This island is too small and too fragile to deal with any increase in this type of tourism. It only will give us a short term boost and will leave a nasty taste on the real market which is the on island vacation-er, regardless of their activity while on the island. This market has done the necessary research to make their choice to visit the island for either one week or more. It is this market that we need to be concentrating more on. As long as long as nobody gets the bright idea to improve on-island transportation, it will be a non-event. The ships will come, a bunch of people will pile off the ship, walk around town, buy t-shirts, then leave. Most don’t snorkel and very few dive so there should be minimal impact to the reef. If you’re worried about pollution, make the cruise lines pay for a world-class sewage treatment plant for the island. They need friendly places to stop and I have no doubt that if the price of being able to dock at Bonaire was spending a few million dollars on construction, it really wouldn’t be a big issue. In fact, while you’re negotiating, make them drop off fresh water. actually many do dive..and many flock to Lac Bay..it’s a freak show on certain days… We do need a sewage plant for sure…I believe the passengers pay 2 USD a head? I worry that the “Care for the reef” ethos that has always been in the forefront on Bonaire will fall by the wayside, the victim of thoughtlessness and greed… how do you make people who never heard of Bonaire and only visit for a few hours even care? It’s too easy – they step off a boat, do whatever they feel like doing, and leave. Those of us who have to plan and struggle and connive just to GET to Bonaire know what it is that’s being destroyed. A possibly / potential carnival will not mean ‘expansion’ of cruise tourism, but merely a replacement of ships that will be getting out of the itinerary…e.g. Pullmantur. I think none of the parties involved are talking about ‘expanding’ cruise tourism… This is not a point anymore. There should be no question about that. Furthermore, government policy should dictate in the end what will happen. We all know this is a topic that is always widely discussed, and both fronts are very strong …. Those that are in favor and those that are not! Both fronts have their strong arguments.. However bear in mind that whatever discussion might be taking place; ‘expansion’ is not being pursued at this moment. Thank you for your email! I think it is important to realize that tourism should reach each and everyone on the island, and this is not accomplished through our stay-over base. There needs to be a balance among both industries. > a balance among both industries. I would like to mention that the cruise ship passengers and the “stay” over” tourists are sometimes the same people and that quite often the ship passengers become the repeating week-long guests. My wife and I visited Bonaire on a cruise, spent a few hours on Bari Reef, and as soon as we got back home, booked a week on the island for two other couples and ourselves. It’s a big commitment to book a trip to an island where the flight comes and goes once a week, since the tourist is essentially stranded if it’s not a good experience. The ships give the tourists the opportunity to take a look around first. If managed properly, the ships can help create more stable tourism, and improve the island for the permanent residents by structuring the fees to cover any infrastructure improvements needed. I don’t think the island residents understand how valuable it is to the cruise lines to have an island that is simultaneously fun, relaxing, non-threatening and not overcome by poverty. Bonaire has significant negotiating power and it would be a waste to not use the ships to benefit the island as a whole.